Supporting a family and feeding multiple mouths can be stressful when you’re living on a tight budget. There are many ways, though, you can save a buck and put some extra cash in your wallet while still supplying your family with a smorgasbord fit for a king. The days of extreme couponing are upon us, but this doesn’t mean you have to spend your days and nights clipping coupons from the newspaper. With advanced technology, store loyalty programs and online coupons, you can shop until you drop without breaking the bank. Subscribe to several Sunday papers: Find out which Sunday paper has the best coupons, then subscribe to it. If you find that you get a lot of good coupons in it on a regular basis, consider getting multiple subscriptions to maximize your savings. But do this only if the cost of the subscription is offset by the amount of savings you get from the coupons. Join the store loyalty program: Most stores have a loyalty program that is free to join. So there’s no reason not to join except that you’ll pay more if you don’t. Sometimes coupons are loaded onto your store savings card, like at CVS. 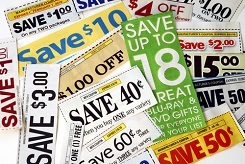 Stack coupons with store sales: You can also follow bloggers who do this. They spend hours matching up coupons with store sales to get the best deal. Don’t re-invent the wheel. Get familiar with store couponing policies: Does your store allow double couponing or using more than one coupon per product? Find out. Each store has a different coupon policy, so it pays to know. Be aware of the coupon expiration date and exclusions: Sunday paper coupons usually expire within 30 days. And with the popularity of TLC’s Extreme Couponing show, there are limits now on how many of the same coupons you can use per transaction and how many products you can buy with the coupon. Some stores, like CVS, place a cap on how many times you can take advantage of an in-store coupon or sale since the coupons are loaded on your card. Shop at more than one store: The way extreme couponers are able to save 90% or more on their purchases is because they shop at multiple stores, multiple times. To save the most money, be willing to go to the store with the best sale for toilet paper. Don’t be loyal to only one store. Plan out your shopping trips: Instead of just heading out to the store, plan ahead to see what’s on sale and which coupons you can use. When you have a plan of what to buy and which coupons to use, shopping trips will be faster and you won’t be stuck figuring things out at the store. Use store rewards towards your next purchase: When you earn store rewards, use them to your advantage. Don’t lose them because they’re like store credit. Use them toward your next purchase, perhaps on items that never have coupons or never go on sale. Print coupons online: There are some coupons that you’ll never see in the Sunday paper because they’re available only online, like at our Coupons.com database. Here are some other resources for printable coupons. Follow your favorite brands on Facebook: Some coupons are available only on Facebook. Follow your favorite brands and be the first to know about special sales and exclusive coupons. Buy the smaller size: It seems counter-intuitive to buy the smaller size, but extreme couponers know how to get the best deal. With the smaller size and a coupon, you’ll maximize your savings. The per unit price will be significantly cheaper than buying the larger size. Yes, coupons are great, but don’t let it become an addiction where you buy something just because you have a coupon and it’s on sale, warns Seto. If you buy something that you or your family will never use, it’s wasteful and you’re not really saving money, you’re just spending money on things you don’t need. You have to ask yourself, are you buying things just because they’re on sale or because you really need them? Breastfeeding moms face a unique challenge when going back to work. While life has to continue on as it did pre-baby, they are now faced with the added task of feeding their baby while at home and providing expressed milk when they are not. Nannies can help make this process easier by following the tips outlined in these 50 blogs. It’s important for breastfeeding moms to focus on consuming high quality, nutrient dense foods and avoid empty calories, both for her nutrition and for that of the baby. You’ll find healthy food suggestions that support breastfeeding on these 10 blogs. Buy fruits and vegetables for the new mom. Baby Center encourages breastfeeding moms to eat a well-balanced diet to benefit both her and the baby. Pick up snacks that are high in protein and nutrient dense for mom. Baby Zone suggests granola; you can even grab the ingredients and make it from scratch. Put together some snacks and stash them in the nursery for mom. Parents explains that it’s important that Mom keep her strength up and snack often. Avoid buying empty calories for mom. Help Mom choose nutrient dense foods and avoid foods comprised of empty calories, says Choose My Plate. Brew Mom a fresh cup – or two! – of coffee. According to Eat Right, the caffeine in 24 ounces of coffee will not harm or affect the baby. Buy plenty of fruits and vegetables, but wash them well. The Mayo Clinic advises that breastfeeding moms eat nutrient rich foods like fresh produce; just make sure they’re washed well to remove all pesticides and chemicals. Add sweet potatoes to the cart. Live Strong explains that sweet potatoes are high in vitamin A, which is an important vitamin for baby. Don’t buy pork. Eirene Health Shop shares a list of foods to avoid; sausage and bacon are at the top of the list. Get plenty of leafy greens. Encourage mom to eat plenty of vegetables, including leafy greens that are high in calcium and folate. Help her drink plenty of water. Add fresh fruit to pitchers of water or buy water mix-ins to encourage Mom to stay hydrated. Spark People explains that breast milk is 50% water, so it’s important for moms to drink plenty of water. While nannies can’t pump for their employer, they can do other things to help. These 10 sites recommend different ways you can ease some of the burden of pumping for your employer. Keep pump equipment washed and dried. 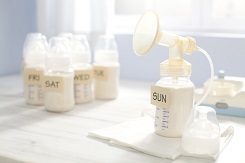 The University of Rochester Medical Center explains how to care for the breast pump and collection kit. Pick up breast milk bags when supplies are getting low. Medela has bags for storing and freezing breast milk. Keep nursing area clean and organized. Make sure there are books, magazines or audio books available for Mom while breastfeeding, suggests Women’s Health. Record some shows for mom to watch while breastfeeding. The Stir suggests catching up on TV shows while breastfeeding. Provide mom with some books to read to the baby while breastfeeding. This bonding time is also the perfect time for mom to start reading to the baby, says When did I get like this? Train as a lactation specialist. Nannies can get training to help new moms breastfeed effectively at a place like Lactation Education Resources. Talk to mom about pacifiers. Kelly Mom advises against pacifiers during the first two months – longer if possible – so it’s important to discuss this with mom. Offer to pick up expressed breast milk from Mom. If Mom is pumping at work, she may be concerned about keeping the milk safe. Newborn Care suggests that the nanny offer to pick up the expressed milk. Keep track of baby’s feedings. The Bump offers a free printable form that the nanny can use to keep track of feedings for Mom. Know how to properly store breast milk and save leftovers. La Leche League reviews the guidelines for storing breast milk. Once you leave for the night, the other kids are going to want Mom’s attention at the same time that the baby needs to be breastfed. 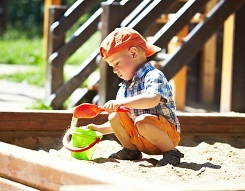 To help keep active toddlers busy, prepare some non-messy activities that allow them to be close to Mom. These 10 sites provide some fun ideas. Put together craft kits for toddlers. Choose crafts that don’t make a big mess or include a lot of small pieces so that the toddler can stay near Mom while doing it. Several options are available on AMC. Create magnetic paper dolls. Paper Thin Personas shares how to create paper dolls and stick them to magnetic sheets so that toddlers can play on the floor near Mom while she is breastfeeding. Make a craft box so the kids can stay busy while the mom nurses. Family Crafts describes how to put together this craft box and gives examples of items to include. Put together waxy strings and a canvas board. Artchoo shares a simple project that the kids can do while Mom is breastfeeding. Set up a mess free finger paint station. Hippie Housewife explains how to set up this craft station so that the toddler can squish paint around while sitting at the table and Mom can nurse in a nearby chair. Cut out some pictures of animal parts and adhere them to some paper. Art Mommie posts about a project where the child is expected to continue drawing the animal from a partial picture. Package up some window clings and page protectors for the toddler. Inner Child Fun explains how to find window clings at the dollar store. Let the kids use them on page protectors to make scenes. Provide paper and stickers in a bag for the toddler. Toddlers love stickers, so grab a variety pack or themed stickers and let the kids create a scene on some paper like Faemom Crafts for Toddlers, Preschoolers and Kids suggests. Grab some pipe cleaners and egg cartons and let the kids get creative. Mom Me suggests having toddlers try to make animals from these items. Put together yarn and a baggie full of colored pasta that kids can string. Yahoo Voices explains how kids can make necklaces or bracelets out of pasta while working on their dexterity and hanging out with Mom. For breastfeeding moms who also have toddlers, life can seem endlessly crazy. Help her out by ensuring that her older kids have healthy snacks already prepared. Whip up some of the recipes found in these 10 posts. Cut up fresh fruit to leave in the fridge for toddlers to snack on while mom nurses. Wholesome Toddler Food suggests letting the toddlers dip the fruit in yogurt. Mix up some fruity pink yogurt and stash it in the fridge. Weelicious provides the recipe for this simple, wholesome snack. Freeze up a batch of no sugar added fruit bars. These bars are a refreshing summer snack for toddlers and come together quickly with the directions on What to Expect. Whip up some pumpkin dip and sliced apples. Cooking Light urges moms to get their kids to try new and healthy foods, but it can be hard for a breastfeeding mom to squeeze finding and making new snacks into her day; help out by making different dishes for her and stashing them in the fridge. Make up a batch of oatmeal snack cakes. Parenting shares the recipe for these snack cakes that can be used as breakfast-on-the-go or a healthy snack. Get creative and make these frozen banana penguins. Treat the kids to a tasty and fun snack that they can eat and play with while Mom is busy nursing. Directions for this adorable snack can be found on Reading Confetti. Leave a tray of strawberry mice with cheese in the fridge. Spoonful explains how to put together these fun snacks that the whole family will love. Bake a batch of these banana bread muffins. For Love of Cupcakes shares this recipe for simple, healthy banana bread muffins that can be eaten for breakfast or as a snack. Spread peanut butter between apple slices and roll edges in nuts or granola. Glad encourages you to make these snacks and place them in small storage bowls so they are ready when the toddler or mom needs a snack. Blend up a batch of blueberry and cucumber smoothies. Make this refreshing, healthy smoothie from Positively Simple. Since there’s no ice cream or ice cubes in it, you can even keep extra in the fridge. Going to work all day is exhausting for anyone – add in breastfeeding and you can end up feeling like a zombie. Take the guesswork out of dinner and help ease some of the stress of the day for your breastfeeding mama by preparing one of these 10 slow cooker recipes. Bake potatoes in the slow cooker. Martha Stewart shares a recipe for stuffed baked potatoes in the slow cooker – the filling can be whipped up in about 10 minutes. Mix up a batch of slow cooker chili. This dish from My Recipes can sit until Mom is ready to eat and can be made with turkey or beef, depending on preference. Put short ribs in bbq sauce early to have tender meat when it’s time to eat. Kraft Recipes shares this rib recipe – just add a veggie for a complete meal! Surprise Mom with a batch of sesame chicken. Has Mom been craving take-out? Surprise her by making up a batch of sesame chicken in the slow cooker and start a batch of rice in the rice cooker before you leave. Recipe found on Moms with Crock Pots. Start a batch of sloppy Joe meat. This meat freezes well, so if there are leftovers it can be used another time. Find the recipe on Moms Who Think. Did you know you can roast a chicken in a slow cooker? Mom Advice explains how you can easily roast a chicken in a crock pot so that it’s ready for dinner when Mom gets home. Get Mom some much needed vitamin A by making this sweet potato soup. Paleo Pot shares this recipe for making sweet potato soup in the slow cooker. Help Mom eat right by roasting a turkey breast in the slow cooker. Skinny Ms. explains how to prepare this dish so that the breast ends up tender and moist. Encourage Mom to eat more protein by making a batch of Lemon Braised Chicken and beans. The Kitchn describes how to use inexpensive beans and a couple of boneless, skinless chicken thighs to make this stew. Provide a comforting meal for a sleep-deprived mom by making this Cheesy casserole. Six Sister’s Stuff shares a cheesy hashbrown casserole recipe that will make a tasty side dish to some burgers Dad can grill. It is inevitable that you will feel stress at some point in your life. 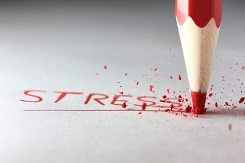 Whether you are frustrated with your job, a relationship, your responsibilities or the challenge of juggling a personal and professional life, stress can creep up on you when you least expect it. Learning to get a handle on stress before it consumes you is key to maintaining a healthy lifestyle, especially when you are caring for little ones who need you to be operating at 100% every moment of the day. It can also lead to a healthier and happier life. According to Lou Ryan, cognitive behavioral training expert and founder of SelfHelpWorks, there are two basic types of coping mechanisms you can use in stressful situations; these are emotion-focused and problem-focused techniques. “Understanding the difference and learning to quickly transition from emotion-focused to problem-focused coping techniques will do wonders to reduce your stress levels, keep you healthier and more resilient,” says Ryan. Denial: Refusal to believe that the stressful situation is real. Behavioral Disengagement: Reducing your efforts to deal with the stressful situation. Self-Distraction: Using an alternative activity to take your mind off the problem. Self-Blame: Blaming and criticizing yourself for what happened. Venting: Focusing on the upsetting experience and complaining about it. Problem-focused coping involves looking at the situation in a different light and finding ways to change it, says Ryan. “When you use problem-focused coping techniques, your resilience and productivity actually increase and you’re also less likely to get stressed out or sick,” he says. Positive Reframing: Thinking about the stressful situation differently and interpreting it in a positive manner. Planning: Thinking about how best to handle the problem and making an action plan. Active Coping: Taking action to get rid of the problem or contain it so it doesn’t spill over into other areas. Acceptance: Accepting the reality of a stressful situation and learning to live effectively with that reality. Being able to transition quickly from emotion-focused coping to problem-focused coping can lower your stress levels dramatically in virtually any situation and keep you bouncing back again and again, no matter what life throws at you, says Ryan. Even though you may recognize that stress exists in your life, sometimes the responsibilities and pressures of caring for children and maintaining your own life can distort your ability to move from emotion-focused coping to problem-focused coping. Time and stress go together like RAM and computer program glitches, says Dr. Robert Neff, chairman of Mental Training, an athletic training organization. “If you don’t have enough of the first one, you’ll soon have too much of the second,” says Neff. Start a to-do list: Perhaps you’ve heard that list-makers feel great when they cross off a completed task or check off reaching a milestone. But do you know why? That simple act releases endorphins – those same chemical signals that make you feel good when something makes you laugh. Avoid list-lock: Thinking you must stick to a list even when your priorities change can cause stress. You must constantly rethink your list and revise it to match reality. The inflexible will soon break if they don’t bend. Set Aside Time at Work: While at work, list home-related chores and do the same at home for tasks you face at work. Reason? Time management experts agree that always trying to separate the personal and the professional causes even more stress. But, they say, integrating the two will help you lead a more organized life. Making your health a priority can also be a motivator to reduce stress. In the midst of a busy day caring for children, take a quick moment to breathe slowly, count to 10, close your eyes and relax with some one-minute meditations. The good news is that you cannot be stressed and relaxed at the same time. Eating healthy is a skill that constantly needs to be on the minds of both children and adults alike. However, it’s easy for little ones to develop habits that include cravings for junk food or even fast food, and when this happens a lesson on nutrition could be just the trick to lead them to a better understanding of wellness. The food pyramid has been a staple part of health classes for decades, but in the last few years the food plate has replaced this diagram as a means to teach children how to select proper portion sizes and foods that are healthy for every meal. A side order of blue symbolizes dairy. According to the nutrition experts at Nemours KidsHealth, the big message is that fruits and vegetables take up half the plate, with the vegetable portion slightly larger than the fruit portion. Younger children may not always know the difference between a grain and a protein, so it is important to offer opportunities for them to learn. A show and tell session is an interactive way to help your children identify foods that should be on their plate. Spend an afternoon in the kitchen lining up foods from each category to help your children differentiate between the food groups. According to KidsHealth, whole-grain products, such as oatmeal, brown rice and whole-wheat bread should also be on display because they help you feel full due to the high fiber content. 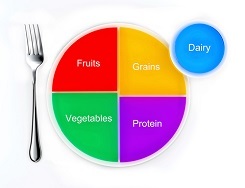 Ask each child to select an item that would fill the plate with the correct portions of vegetables, fruits, protein and grains. Add a small side of dairy, too. If a mess in the kitchen is not something you are ready for, consider launching a scavenger hunt in the grocery store with your children. Have your children make a list of items that would fall under each category on the plate and ask them to point out as many items on the shelves that are grains, proteins, fruits, vegetables and dairy. Make the game interesting by allowing each child to plan a healthy lunch or dinner and then buy the items needed to prepare the meal. Beyond teaching your child what foods to choose to fill his plate, it also helps to provide him with knowledge about the benefits of these healthy foods. For example, show him that carbohydrates, found in the Grains group, help our bodies gain energy. B vitamins and iron in grains also help keep their blood pumping, help them grow and nourish the brain – all necessary for a healthy development. According to the health experts at PBSKids.org, the vitamins in vegetables are healthy for teeth and gums, skin, hair, eyesight and brain function, while the fiber found in fruits is good for the heart and can help prevent heart disease and cancer. Teach your child that milk helps them grow big and strong and that the calcium in dairy products, such as cheese and yogurt, can make their bones and teeth stronger. Proteins not only help the blood flow but also repair body tissues when they need it. Proteins also help convert food to energy – something your child needs when playing sports or playing outdoors. Providing clear-cut examples for your child and helping him learn about healthy food through games and activities will likely take the groans and moans away when it is time for dinner. As a parent or nanny, it often seems like you have to be a mind reader. Is your little one hungry? Are those cries from teething or do they signify general fussiness from a sleepy baby? As your newborn develops, you may also be wondering what he is thinking or what he needs to develop into a healthy child. The guessing game is common for new parents and nannies; however, learning what to expect from a baby and learning how babies think can help you uncover how to meet his needs. Just as adults learn from trial and error through daily interactions, babies also learn by experience. “Since they are not yet verbal or do not have the mental capacities early on for language meaning, babies learn by using their primary senses and taking everything in,” says Alicia Clark, licensed clinical psychologist in Washington, D.C.
One of the best things you can do to help your baby learn is to interact with him on a regular basis. Ever wonder why your baby ‘coos’ or smiles when your face is near hers? It’s because she can sense you are near and has become familiar with you, even if she can’t see you clearly. Your face can help your child learn and also form a bond with you early on. “Interacting with faces forms the beginning of social development and the child learns about connections in the world,” says Clark. Sleep is also an essential component of your child’s ability to lead a healthy lifestyle – both mentally and physically. “Like with adults, sleep appears to be needed in babies to assimilate learning, allow for mental and physical growth and of course, refresh them for their next bout of awake time,” says Clark. Let’s face it. Siblings will not always get along. From squabbles over a toy to frustrations over privacy, children of all ages do not always long to be best friends with their brothers or sisters. However, sibling rivalry does not have to disrupt your household. In order to help your children bond and form friendships with each other, it’s important to set the stage for a friendly environment. Launching games and activities that will help them see the benefits of getting along can only encourage a friendship that will last a lifetime. In order to help your children form friendships with each other, it’s key to understand why your little ones test the boundaries, launch competitions with each other and argue over every little thing when together. 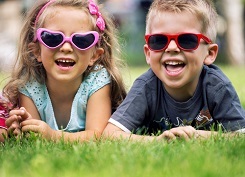 By helping your children understand the preferences of her siblings, this sets the stage for thriving in social development as your child matures, says Dessauer. For example, ask the siblings to use blocks and build something together or create a fort from sticks in the backyard. Make sure, too, that the children have a say in the games you encourage them to play. “The ideas are often what the children choose and allow for more investment,” says Dessauer. If your little one is mesmerized by super heroes or Star Wars games, you can facilitate these ideas by asking the children to pick a favorite Star Wars character or comic book character and make a world together that they live in. Break out the Legos, modeling clay, markers, paper and pipe cleaners and ask the children to make an island they live on, or a school, a world, a planet or even virtual video game. The key is to encourage your children to engage in activities that produce an end product – something they were able to accomplish together. For example, set the stage for a play production and ask the siblings to act it out together. Or, have them brainstorm a music video, choreography or even a feature film that you can record and share with the family. A game of charades will also prompt your children to work together and communicate with body language – an important skill that helps them learn more about each other when they are guessing and interpreting each other’s cues. “You can do any of these activities indoors or outdoors, but regardless, they allow lots of flexibility for learning about each other and how to communicate what they like and don’t like,” says Dessauer. Even though it may be tempting to step in and moderate disagreements as they happen, resist the urge to take over, says Dessauer. “As a parent or nanny, allow your children an opportunity to work through their problems before stepping in and allow the space to get messy (as this allows for a child to get messy with her emotions as well) and be there to support them as they work through compromise and communication,” she says. A leaky faucet, an overgrown lawn and a broken step often prompt people to call in service personnel right away to avoid the hassle of completing the work yourself. However, home improvement tasks – even new construction – are often simpler than you think. As a parent or nanny, you can tackle minor home improvement jobs in a flash with some quick fixes and décor tricks that will save you money and offer a sense of accomplishment. Why not launch a DIY project with the kids that the entire family can admire for years to come? Try these suggestions from interior design professionals and dress up your home. For an easy to do fix, splash some color on your walls to spruce up your home. Painting a room when using the right colors can add warmth, texture and depth to any room, says Bayanne Mihtar, San Diego-based interior designer with Bayanne Design Group. “This is an easy to do and inexpensive project that will change the look of a room and lift the mood when you feel you have created a brand new space,” she says. When painting, the time you will spend brushing on your favorite color will be significantly less than the time you spend preparing to paint, as 80% of the project is taping and setting up painting mats and tarps to cover your furniture, says Mihtar. Once you are ready to roll the paint brush, always do brush work in corners first and then use the roller to flatten any brush strokes, says Mihtar. “Using an extension pole will cut the effort and save time in the paint job,” she says. Begin by removing the doors and drawers and labeling the spots where they belong for easy re-installation. Use a couple coats of gloss or semigloss paint on the doors and cabinets, suggests Mihtar. “Adding a sealer after they have dried ensures they will last longer against use,” she says. Once you have spruced up the color, it’s time to begin shopping for new hardware, such as handles and knobs. “Make sure to take the old hardware when purchasing new ones to make sure you get the correct size,” warns Mihtar. If you have extra space in your home, treat yourself to a hobby room by transforming a small guest room or office into a luxurious “me” room. “Whether you’re into art, sewing, gift wrapping or scrapbooking, you can fill your time by being able to have a space all to yourself to do something enjoyable,” says Mihtar. “By painting the room, adding organizational shelves, a desk or a table, you can have the room of your dreams. Make the room multifunctional, too, by adding a pull out couch to host guests in your home during the holidays or summer vacations. The benefits of doing these projects on your own instills a sense of accomplishment and sets a prime example for your children. “It is also cost effective and often fun projects to take on without being too messy,” says Capra. When caring for children, it may seem like you are running versus walking everyday. Whether you’re gathering the crew to leave for a jaunt to the park or chasing toddlers from one room to the next, you definitely get a workout in as a nanny or parent. However, there are many sedentary moments while caring for children, and it can be tempting to sit back and watch a TV show on the couch when you have a rare moment to yourself. Instead of wasting time in front of the TV, though, consider going for a walk. Exercise is the key to a healthy lifestyle, but you don’t have to break the bank with an expensive gym membership or even run a marathon to improve your health. Walking is enough and here’s why. According to Carolyn Phillips, certified personal trainer and owner of Fit Behavior, a wellness facility in Connecticut, walking and running burn about the same amount of calories per mile. 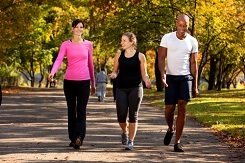 Walking also helps you transition slowly into an exercise routine. Although walking is a normal part of your daily routine while caring for children, incorporating longer walks into your day can also prepare your body for an exercise routine. To get started, Phillips recommends you begin your walking program with 15 to 20 minute walks three times for the first week. Increase your walking volume by 20% per week up to six weeks and try to work up to five sessions a week for 30 to 45 minutes each time, especially if you’re trying to drop some pounds, says Phillips. To track your progress and motivate you to keep walking, purchase a pedometer to help determine the miles you have accomplished as well as the miles you have put on your trusty pair of shoes. “Do not exercise day after day with a pain that won’t go away,” she says. “Stop walking for two or three days and then you can start up at half the distance.” Seek diagnosis from a physician if the pain continues to persist. The benefits of walking enhance our physical condition and combat disease, says Phillips. “Walking also benefits mental fitness by increasing circulation to the brain, bringing needed oxygen to brain cells,” she says.